Comfortable seating for therapists and professionals, allows easy access to the patient and equipment. Square armrests make sitting down and getting up safe and easy. Soft, comfortable and water-resistant vinyl seat cover. Adjustable foot rest. Attractive solid maple construction. 300 pound capacity. 26" floor to seat, 24" width, 41" height, 23.5" depth. Height adjustable (18"-24") "screw-type" revolving stool with round footrest. 2" hooded carpet casters. 14" diameter, 4" thick padded seat. 250 pound weight capacity. Height adjustable (18"-24") "screw-type" revolving stool with round footrest. 2" hooded carpet casters. 14" diameter, 4" thick padded seat. 250 pound weight capacity. Upholstery color options available. 3" padded seat. 18" fixed height. 250 pound weight capacity. With 2" hooded carpet caster. 3" padded seat. 18" fixed height. 250 pound weight capacity. With 2" hooded carpet caster. Upholstery color options available. 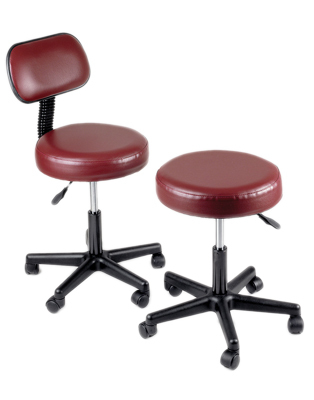 Therapy stool with round, 3" upholstered swivel seat allows easy access for the patient and to equipment. Gas spring for easy raising and lowering of stool (18-22").